We recently showed that mice lacking B and T lymphocyte attenuator (BTLA), a third inhibitory coreceptor expressed on B cells and T cells, exhibit an increased Ag-specific IgG response and gradually develop hyper-γ–globulinemia and autoantibody production. Recent studies revealed that follicular Th (Tfh) cells, which are non-Th1, non-Th2 effector T cells that express CXCR5 and provide help for B cells to produce Ig, also express BTLA. However, the role of BTLA in Tfh cell function remains unknown. In this study, we examined the regulatory role of BTLA in the development and function of Tfh cells. We found that CXCR5+ Tfh cells expressed higher levels of BTLA than did CXCR5− conventional CD4+ T cells. We also found that adoptive transfer of BTLA−/− CD4+ T cells, stimulated under Tfh cell-inducing conditions (Tfh-like cells), to wild-type (WT) mice induced more Ag-specific IgG2a and IgG2b production compared with that of WT Tfh-like cells. By contrast, another adoptive-transfer experiment using BTLA−/− mice as recipients showed that the expression of BTLA on B cells was not involved in the regulation of Tfh-like cell-mediated Ag-specific IgG responses. Moreover, the development of IL-21–producing CXCR5+ Tfh-like cells was significantly increased in BTLA−/− CD4+ T cells compared with WT CD4+ T cells. Furthermore, Tfh-like cell-mediated IgG responses were abolished when IL-21R−/− mice were used as recipients. These results suggest that BTLA signaling suppresses IL-21 production from Tfh cells and subsequent Tfh cell-mediated IgG responses. Follicular Th (Tfh) cells are a subset of effector T cells that helps the development of Ag-specific B cell responses in the germinal centers (GCs) (1–3). Tfh cells are characterized by the expression of CXCR5, which is a receptor for CXCL13 and allows them to localize to the follicular regions of lymphoid organs to form stable contacts with Ag-primed B cells (1–3). ICOS/ICOS ligand interaction plays a crucial role in the development and functional maturation of Tfh cells in vivo (4, 5). In addition, it was recently demonstrated that IL-21, a type I cytokine with significant homology to IL-2, IL-15, and IL-4 (6–8), is produced by Tfh cells and functions as an autocrine growth factor for Tfh cells (9, 10). Moreover, a number of studies showed that IL-21 induces proliferation, differentiation, class switching, and apoptosis of B cells, depending on the developmental stage of B cells and cytokine environments (6–8, 11–13), underscoring the significance of IL-21 in the regulation of Ag-specific humoral immunity. B and T lymphocyte attenuator (BTLA/CD272) is a third inhibitory coreceptor expressed on T and B cells (14–16). The TNFR family member herpesvirus entry mediator (HVEM) (17) is a ligand of BTLA; the ligation of BTLA with HVEM results in Src homology 2 domain-containing protein tyrosine phosphatase (SHP)-1/SHP-2 association and the attenuation of IL-2 production and T cell proliferation (18, 19). Consistent with these in vitro findings, the sensitivity to experimental autoimmune encephalomyelitis, as well as Ag-specific IgG responses, is enhanced in BTLA−/− mice (20). In addition, we recently showed that BTLA−/− mice gradually develop hyper-γ–globulinemia, anti-nuclear Ab, and anti-dsDNA Ab (21). These findings indicate that BTLA negatively regulates humoral immune responses and also plays an important role in immune surveillance. Furthermore, it was demonstrated recently that Tfh cells express BTLA (9, 22). However, the role of BTLA in the development and function of Tfh cells remains unknown. In this study, we examined the regulatory role of BTLA in the development and function of Tfh cells using BTLA−/− mice. We found that the transfer of BTLA−/− CD4+ T cells, stimulated under Tfh cell-inducing conditions (Tfh-like cells), to wild-type (WT) mice induced more Ag-specific IgG responses compared with WT Tfh-like cells. We also found that the development of IL-21–producing Tfh-like cells was significantly increased in BTLA−/− CD4+ T cells compared with WT CD4+ T cells. Furthermore, we demonstrated that IL-21 was essential for Tfh-like cell-mediated IgG responses. Our results suggest that BTLA signaling suppresses IL-21 production from Tfh cells and subsequent Tfh cell-mediated IgG responses. BALB/c mice were purchased from Charles River Laboratories (Atsugi, Kanagawa, Japan). IL-21R−/− mice (23) and BTLA−/− mice (20) were backcrossed over eight generations onto BALB/c mice. OVA-specific DO11.10 TCR transgenic (DO11.10) mice on a BALB/c background were described previously (24). All mice were housed in microisolator cages under specific pathogen-free conditions. The Chiba University Animal Care and Use Committee approved animal procedures used in this study. Abs to CD3 (145-2C11), CD28 (37.51), CD44 (IM7), CXCR5 (2G8), IL-4 (11B11), IL-6 (MP5-20F3), and IFN-γ (XMG1.2) were purchased from BD Biosciences (San Jose, CA). Anti-CXCR5 PE was purchased from BioLegend (San Diego, CA). Murine IL-6 was purchased from PeproTech (Rocky Hill, NJ). Human TGF-β, murine IL-21, and IL-21R-Fc chimera were purchased from R&D Systems (Minneapolis, MN). KJ1-26 mAb, which recognizes DO11.10 TCR, anti-BTLA mAbs (8F4 and 6F7), and anti–PD-1 mAb (J43) were purchased from eBioscience (San Diego, CA). Naive CD4+ T cells were isolated from lymph nodes of mice using a naive CD4+ T cell isolation kit II, according to the manufacturer’s instructions (Miltenyi Biotec, Auburn, CA). Collected cells were >98% pure CD62LhighCD25−CD4+ T cells by FACS analysis. Naive CD4+ T cells were stimulated with OVA323–339 peptide (OVAp) presented on irradiated BALB/c splenocytes as APCs (OVAp+APCs) in neutral conditions (anti–IL-6 mAb, anti–IL-4 mAb, and anti–IFN-γ mAb), Tfh cell-inducing conditions (IL-6, anti–IL-4 mAb, and anti–IFN-γ mAb), or Th17 cell-inducing conditions (TGF-β, IL-6, anti–IL-4 mAb, and anti–IFN-γ mAb), as described previously (25). Intracellular cytokine staining of IL-21 was performed as described previously (25), with minor modifications. In brief, cultured cells were stimulated with PMA (20 ng/ml; Calbiochem, San Diego, CA) plus ionomycin (1 μg/ml; Calbiochem) or OVAp+APCs at 37°C for the indicated times in the presence of monensin (2 μM) (Sigma-Aldrich, St. Louis, MO). Cells were first stained with Abs against surface molecules at 4°C. Cells were then fixed, permeabilized with Perm/Wash buffer (BD Biosciences), and incubated with IL-21R–Fc chimera (R&D Systems) and anti–IL-4 PE (BVD4-1D11; BD Biosciences), anti–IFN-γ PE (XMG1.2; BD Biosciences), or anti–IL-17A PE (TC11-18H10; BD Biosciences) for 30 min at 4°C. Cells were then washed with Perm/Wash buffer and incubated with allophycocyanin-conjugated affinity-purified F(ab′)2 fragment of donkey anti-human IgG (H+L) (Jackson ImmunoResearch Laboratories, West Grove, PA) for 30 min at 4°C. Cytokine profiles were analyzed on a FACSCalibur using CellQuest Pro software (BD Biosciences). Mice were immunized i.p. with OVA emulsified with CFA (OVA+CFA; Difco, Detroit, MI). Seven days later, a single-cell suspension of splenocytes was assessed for the expression of CXCR5, CD44, PD-1, and BTLA on CD4+ T cells by FACS. Naive CD4+ T cells from DO11.10 mice or DO11.10 BTLA−/− mice were stimulated with OVAp+APCs in neutral conditions or Tfh cell-inducing conditions for 6 d. Live cells (4 × 106 cells/mouse) were harvested using Lympholyte M (Cedarlane Laboratories, Hornby, Ontario, Canada) and transferred i.v. to BALB/c mice, IL-21R−/− mice, or BTLA−/− mice. The recipient mice were immunized i.p. with OVA emulsified with IFA (OVA+IFA; Difco). Seven days later, sera were collected, and the levels of OVA-specific IgG1, IgG2a, and IgG2b were measured by ELISA, as described previously (26). The pooled serum of DO11.10 Tfh-like cell-transferred, OVA+IFA-immunized BALB/c mice was used as a standard for OVA-specific IgG1, IgG2a, and IgG2b (positive controls); the levels of OVA-specific IgG1, IgG2a, and IgG2b in individual mice were expressed as OD units relative to the level of the pooled positive controls. The levels of OVA-specific IgE in sera were measured by an OVA-specific IgE ELISA Kit (Shibayagi, Gunma, Japan). Data are presented as mean ± SD. The statistical analysis of the results was performed using the unpaired t test; p values <0.05 were considered significant. To address the role of BTLA in the development and function of Tfh cells, we first assessed the expression of BTLA on Tfh-like cells in OVA-specific TCR transgenic DO11.10 mice. As shown in Fig. 1A (upper panels), the percentage of CXCR5+ Tfh-like cells among OVA-specific TCR-expressing CD4+ T cells (KJ1-26+CD4+ T cells) was significantly increased by the stimulation with OVAp+APCs in Tfh cell-inducing conditions (IL-6, anti–IL-4 mAb, and anti–IFN-γ mAb) compared with that in neutral conditions (anti–IL-4 mAb, anti–IFN-γ mAb, and anti–IL-6 mAb) or Th17 cell-inducing conditions (IL-6, TGF-β, anti–IL-4 mAb, and anti–IFN-γ mAb). 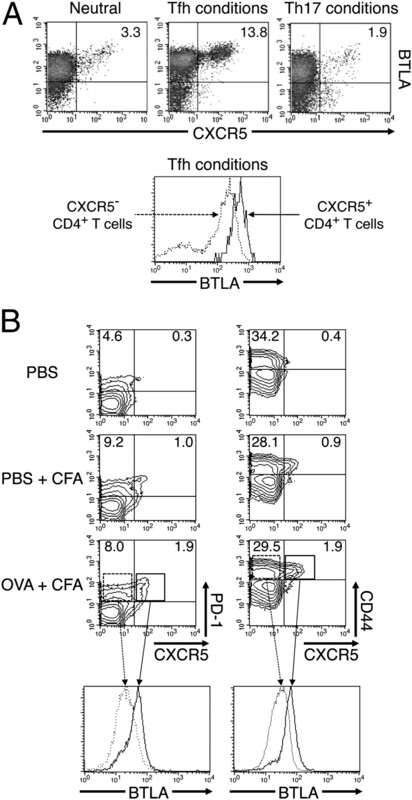 CXCR5+ Tfh-like cells expressed higher levels of BTLA compared with CXCR5− CD4+ T cells (Fig. 1A, bottom panel). Because HVEM could interact with BTLA in cis on T cells in which HVEM and BTLA are expressed (27), and it may affect the detection of BTLA on the cell surface, we examined the expression of BTLA on Tfh-like cells using another mAb (clone 6F7), the epitope by which it is detected does not seem to be masked by BTLA–HVEM interaction (27), and confirmed the high expression of BTLA on Tfh-like cells (data not shown). Tfh cells express higher levels of BTLA than do CXCR5− conventional CD4+ T cells. A, Naive CD4+ T cells from DO11.10 mice were stimulated with OVAp+APCs under neutral conditions (anti–IL-4 mAb, anti–IFN-γ mAb, and anti–IL-6 mAb), Tfh cell-inducing conditions (IL-6, anti–IL-4 mAb, and anti–IFN-γ mAb), and Th17 cell-inducing conditions (IL-6, TGF-β, anti–IL-4 mAb, and anti–IFN-γ mAb). Six days later, cultured CD4+ T cells were restimulated with OVAp+APCs for 24 h. Representative FACS profiles of CXCR5 versus BTLA staining gating on KJ1-26+CD4+ T cells are shown (upper panels). Representative graphs for BTLA expression gating on CXCR5+ cells (solid line) and CXCR5− cells (dashed line) in KJ1-26+CD4+ T cells are shown (bottom panel) (n = 4 experiments in each group.) B, BALB/c mice were immunized i.p. with OVA+CFA. As controls, BALB/c mice were injected i.p. with PBS+CFA or PBS alone. Seven days later, CD4+ T cells were assessed for the expression of CXCR5, BTLA, and PD-1 or CD44. Representative FACS profiles of CXCR5 versus PD-1 or CXCR5 versus CD44 staining on CD4+ T cells (upper panels) and the graphs for BTLA on the indicated population (bottom panels) are shown (n = 4 mice each). We also examined the expression of BTLA on Tfh cells in vivo. BALB/c mice were immunized i.p. with OVA+CFA; 7 d after immunization, the expression of BTLA on Tfh cells (identified as CXCR5+PD-1+CD4+ T cells) was examined in the spleen cells. The percentage of CXCR5+PD-1+CD4+ T cells was significantly increased by OVA+CFA immunization via the i.p. route compared with by the administration of PBS+CFA or PBS alone (Fig. 1B). CXCR5+PD-1+CD4+ T cells expressed higher levels of BTLA compared with CXCR5−PD-1+CD4+ T cells (Fig. 1B). Among CD44highCD4+ T cells, CXCR5+ cells also expressed higher levels of BTLA compared with CXCR5− cells (Fig. 1B). Given that Tfh cells expressed higher levels of BTLA than CXCR5−CD4+ T cells (Fig. 1), we next examined the role of BTLA in the development of Tfh cells. We first examined Ag-induced development of Tfh cells in BTLA−/− mice in vitro. Naive CD4+ T cells from DO11.10 BTLA−/− mice or control DO11.10 mice were stimulated with OVAp+APCs under Tfh cell-inducing conditions or neutral conditions (as controls) for 6 d. As shown in Fig. 2A, CXCR5+CD4+ T cells were induced equally in DO11.10 BTLA−/− mice and DO11.10 mice under Tfh cell-inducing conditions (n = 5 mice each). We also examined the role of BTLA in the development of Tfh cells in vivo. BTLA−/− mice and littermate WT mice were immunized i.p. with OVA+CFA; 7 d later, the development of CXCR5+PD-1+CD4+ T cells in spleen was examined. As shown in Fig. 2B, the numbers of CXCR5+PD-1+CD4+ T cells were increased similarly after OVA+CFA immunization in BTLA−/− mice and WT mice (n = 5 mice each). These results suggest that BTLA is not involved in the development of Tfh cells. Development of Tfh cells is not affected, but the development of GC B cells is increased in BTLA−/− mice. A, Naive CD4+ T cells from DO11.10 mice or DO11.10 BTLA−/− mice were stimulated with OVAp+APCs under Tfh cell-inducing conditions for 6 d and were then restimulated with OVAp+APCs for 24 h. The expression of CXCR5 on KJ1-26+CD4+ T cells was analyzed by FACS. Data are means ± SD of the frequency of CXCR5+ cells in KJ1-26+CD4+ T cells (n = 5 mice). B and C, BTLA−/− mice and WT mice were injected i.p. with OVA+CFA or PBS+CFA (as controls). Seven days later, splenocytes were harvested and analyzed by FACS. B, Data are means ± SD of the number of CXCR5+PD-1+CD4+ T cells in spleen (n = 5 mice). C, Representative FACS profiles of GL-7 versus Fas staining on B220+ cells and means ± SD of the number of GL-7+Fas+ B cells in spleen are shown (n = 5 mice). *p < 0.05. We next analyzed the development of GC B cells (GL-7+Fas+B220+ cells), which is enhanced by Tfh cells (28), in BTLA−/− mice. Importantly, the number of GL-7+Fas+ B cells was significantly increased in BTLA−/− mice compared with WT mice upon OVA+CFA immunization (n = 5 mice; p < 0.05) (Fig. 2C). These results suggest that BTLA−/− Tfh cells may functionally enhance the development of GC B cells more than WT Tfh cells. To determine whether BTLA−/− Tfh cells enhance the development of GC B cells and IgG production, we performed adoptive-transfer experiments of BTLA−/− or WT Tfh-like cells to WT mice. Naive CD4+ T cells from DO11.10 mice and DO11.10 BTLA−/− mice were stimulated with OVAp+APCs in Tfh cell-inducing conditions or neutral conditions, and these cells were transferred to BALB/c mice. Recipient mice were immunized with OVA+IFA; 7 d later, the numbers of Tfh cells and GC B cells in spleen and the levels of OVA-specific Igs were evaluated. As shown in Fig. 3A (left panels), the numbers of donor Tfh cells (KJ1-26+CXCR5+CD4+ cells) were increased similarly by OVA+CFA immunization in DO11.10 Tfh-like cell-transferred mice and DO11.10 BTLA−/− Tfh-like cell-transferred mice (n = 7 mice each). 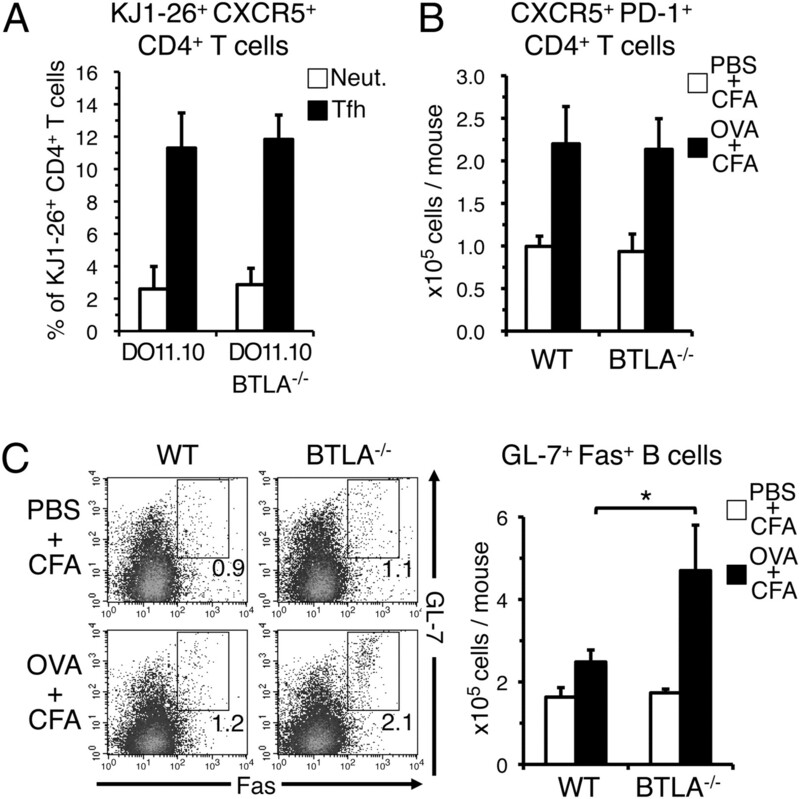 In contrast, the adoptive transfer of Tfh-like cells significantly increased the development of GL-7+Fas+ B cells, with high efficiency by DO11.10 BTLA−/− Tfh-like cells compared with DO11.10 Tfh-like cells (Fig. 3A, right panels) (n = 7 mice; p < 0.05). As expected, the transfer of DO11.10 Tfh-like cells significantly enhanced OVA-specific IgG1, IgG2a, and IgG2b production compared with the transfer of DO11.10 CD4+ T cells that were stimulated in neutral conditions (n = 19 mice each; p < 0.01) (Fig. 3B). Importantly, DO11.10 BTLA−/− Tfh-like cells significantly increased the levels of OVA-specific IgG2a and IgG2b, but not IgG1, compared with DO11.10 Tfh-like cells (n = 19 mice; p < 0.05) (Fig. 3B). In contrast, when DO11.10 BTLA−/− CD4+ T cells or DO11.10 CD4+ T cells were stimulated in neutral conditions, transferred to WT mice, and then immunized, DO11.10 BTLA−/− CD4+ T cells and DO11.10 CD4+ T cells (n = 19 mice) induced similar levels of OVA-specific IgG2a and IgG2b (Fig. 3B), suggesting a crucial role for BTLA in Tfh cell function for IgG2a and IgG2b production. OVA-specific IgE was not detectable in this experimental setting (data not shown). BTLA−/− Tfh-like cells induce more IgG2a and IgG2b production. Naive CD4+ T cells from DO11.10 mice or DO11.10 BTLA−/− mice were stimulated with OVAp+APCs under neutral conditions or Tfh cell-inducing conditions for 6 d. These cells (4 × 106/mouse) were transferred i.v. to BALB/c mice. As a control, BALB/c mice were injected i.v. with PBS. Ten minutes after the cell transfer, the mice were immunized i.p. with OVA+IFA. A, Seven days later, splenocytes were harvested and analyzed by FACS. Representative FACS profiles of KJ1-26 versus CXCR5 staining on CD4+ cells and GL-7 versus Fas staining on B220+ cells are shown (upper panels). Means ± SD of the number of KJ1-26+CXCR5+CD4+ T cells and of GL-7+Fas+ B cells in spleen are also shown (n = 7 mice each) (bottom panels). B, Seven days later, sera were collected and OVA-specific IgG1, IgG2a, and IgG2b were evaluated by ELISA. Data are means ± SD of levels of OVA-specific IgG1, IgG2a, and IgG2b relative to the levels of pooled positive controls (n = 19 mice each). *p < 0.05; **p < 0.01. Because BTLA is expressed on B cells (20, 29) and was reported to function as an inhibitory coreceptor on BCR signaling (30), we next performed another adoptive-transfer experiment in which BTLA−/− mice were used as recipients to address the role of BTLA expressed on B cells in the development of GC B cells and IgG production. As shown in Fig. 4A, the numbers of donor Tfh cells recovered in the recipient mice were comparable between Tfh-like cell-transferred BTLA−/− mice and Tfh-like cell-transferred WT mice. The numbers of GC B cells (Fig. 4A) and the levels of OVA-specific IgG1, IgG2a, and IgG2b (Fig. 4B) after OVA+IFA immunization were also comparable between Tfh-like cell-transferred BTLA−/− mice and Tfh-like cell-transferred WT mice (n = 7 mice each). Taken together with the data shown in Fig. 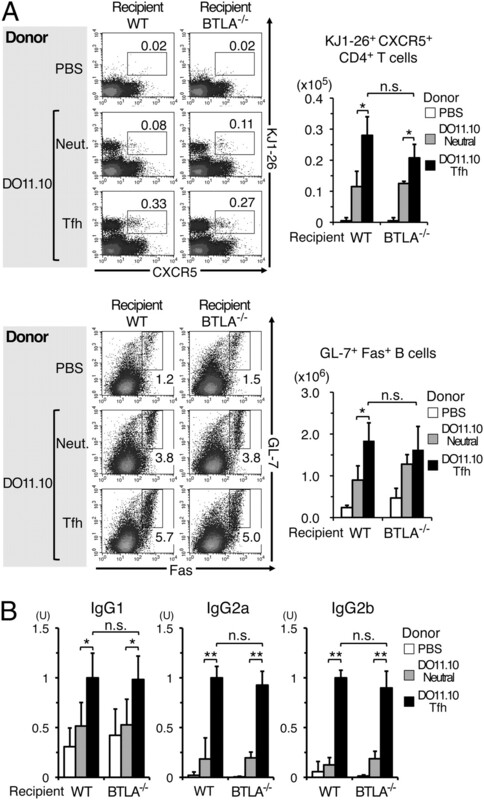 3, these results suggest that BTLA expressed on Tfh cells, rather than on B cells, is primarily involved in the regulation of Tfh cell-mediated IgG2 responses. BTLA expressed on B cells is not involved in the regulation of Tfh-like cell-mediated IgG production. Naive CD4+ T cells from DO11.10 mice were stimulated with OVAp+APCs under neutral conditions or Tfh cell-inducing conditions for 6 d. Cells (4 × 106/mouse) were transferred i.v. to BTLA−/− mice or littermate WT mice. Ten minutes after the cell transfer, the mice were immunized i.p. with OVA+IFA. A, Seven days later, splenocytes were harvested and analyzed by FACS. Representative FACS profiles of KJ1-26 versus CXCR5 staining on CD4+ cells and GL-7 versus Fas staining on B220+ cells are shown. Means ± SD of the number of KJ1-26+CXCR5+CD4+ T cells and of GL-7+Fas+ B cells are also shown (n = 7 mice). B, Seven days later, sera were collected, and OVA-specific IgG1, IgG2a, and IgG2b were evaluated. Data are means ± SD of levels of IgG1, IgG2a, and IgG2b relative to the levels of pooled positive controls (n = 7 mice each). *p < 0.05; **p < 0.01. n.s., not significant. We showed that Tfh-like cells played a crucial role in the development of GC B cells and IgG production and that BTLA−/− Tfh-like cells induced more IgG2a and IgG2b production (Fig. 3). Because IL-21 is a representative cytokine of Tfh cells and is involved in humoral immune responses (7, 8), we next examined IL-21 production from BTLA−/− Tfh-like cells at single-cell levels by intracellular IL-21 staining (25). Naive CD4+ T cells from DO11.10 BTLA−/− mice or DO11.10 mice were stimulated with OVAp+APCs under neutral conditions or Tfh cell-inducing conditions for 6 d; the expression of IL-21, IL-17A, IL-4, and IFN-γ was assessed after restimulation with OVAp+APCs for 6 h. As shown in Fig. 5A, ~10% of CD4+ T cells cultured under Tfh cell-inducing conditions produced IL-21 in control DO11.10 mice. Importantly, the frequency of IL-21–producing CD4+ T cells was significantly greater in BTLA−/− DO11.10 mice than in DO11.10 mice (n = 5 each; p < 0.05) (Fig. 5A). In contrast, in neutral conditions, IL-21 production was not detected, even in DO11.10 BTLA−/− CD4+ T cells (Fig. 5A). Although, in addition to Tfh cells, Th2 and Th17 cells were shown to produce IL-21 (7, 8), IL-21–producing CD4+ T cells in Tfh cell-inducing conditions did not produce IL-4 or IL-17A in DO11.10 BTLA−/− mice or DO11.10 mice (Fig. 5A), suggesting that IL-21–producing CD4+ T cells in Tfh cell-inducing conditions are neither Th2 cells nor Th17 cells. 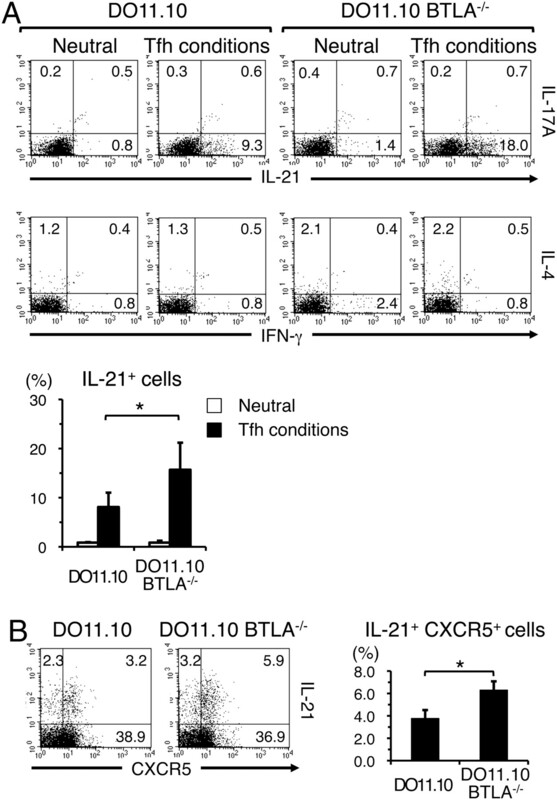 Development of IL-21–producing Tfh-like cells is increased in the absence of BTLA. A, Naive CD4+ T cells from DO11.10 mice or DO11.10 BTLA−/− mice were stimulated with OVAp+APCs under neutral conditions or Tfh cell-inducing conditions for 6 d. Cells were restimulated with OVAp+APCs for 6 h, and intracellular cytokine staining for IL-21, IL-17A, IL-4, and IFN-γ was performed. Representative FACS profiles gating on KJ1-26+CD4+ T cells and means ± SD of the frequency of IL-21–producing cells in KJ1-26+CD4+ T cells are shown (n = 5 experiments each). B, Naive CD4+ T cells from DO11.10 mice or DO11.10 BTLA−/− mice were stimulated with OVAp+APCs under Tfh cell-inducing conditions for 6 d. Cells were restimulated with OVAp+APCs for 24 h, and the expression of CXCR5 and intracellular IL-21 was examined. Representative FACS profiles of CXCR5 versus IL-21 staining on KJ1-26+CD4+ T cells and means ± SD of the frequency of IL-21–producing cells in KJ1-26+CD4+ T cells are shown (n = 5 experiments each). *p < 0.05. To address the cell type that produces IL-21 in Tfh cell-inducing conditions in more detail, we performed double staining of intracellular IL-21 and surface CXCR5 on CD4+ T cells in Tfh cell-inducing conditions. As shown in Fig. 5B, although the numbers of CXCR5+CD4+ T cells were comparable between DO11.10 BTLA−/− mice and DO11.10 mice, the frequency of IL-21–producing CXCR5+CD4+ T cells was significantly increased in DO11.10 BTLA−/− mice compared with DO11.10 mice (n = 5 each; p < 0.05). Finally, we examined the role of IL-21 in Tfh-like cell-mediated IgG production in vivo. Naive CD4+ T cells from DO11.10 mice and DO11.10 BTLA−/− mice were stimulated with OVAp+APCs in Tfh cell-inducing conditions and then transferred to IL-21R−/− mice or littermate WT mice. Recipient mice were immunized with OVA+IFA, and the levels of OVA-specific IgG1, IgG2a, and IgG2b were evaluated. Again, when WT mice were used as recipients, DO11.10 BTLA−/− Tfh-like cells induced more IgG2a and IgG2b production than DO11.10 Tfh-like cells (n = 13 mice each; p < 0.05) (Fig. 6). The levels of OVA-specific IgG1, IgG2a, and IgG2b were significantly decreased in DO11.10 Tfh-like cell-transferred IL-21R−/− mice compared with DO11.10 Tfh-like cell-transferred WT mice (n = 13 mice; p < 0.01), indicating that IL-21 signaling is essential for Tfh-like cell-mediated IgG production. In addition, the enhancement of IgG2a and IgG2b production by the transfer of DO11.10 BTLA−/− Tfh-like cells did not occur when IL-21R−/− mice were used as recipients (Fig. 6). Taken together, these results suggest that BTLA suppresses IL-21 production from Tfh cells and subsequent IL-21–dependent humoral immune responses. IL-21 signaling is essential for Tfh-like cell-mediated IgG production. Similar to Fig. 3, naive CD4+ T cells from DO11.10 mice or DO11.10 BTLA−/− mice were stimulated with OVAp+APCs under Tfh cell-inducing conditions for 6 d and then cells (4 × 106/mouse) were transferred i.v. to BALB/c mice or IL-21R−/− mice. Ten minutes after the cell transfer, the mice were immunized i.p. with OVA+IFA. Seven days later, the sera were collected, and the levels of OVA-specific IgG1, IgG2a, and IgG2b were evaluated by ELISA. Data are means ± SD of levels of OVA-specific IgG1, IgG2a, and IgG2b relative to the levels of pooled positive controls (n = 13). *p < 0.05; **p < 0.01. In this study, we investigated the role of BTLA in the development and function of Tfh cells. We showed that BTLA regulates IL-21 production from CXCR5+ Tfh-like cells and subsequent IgG responses. We found that BTLA was highly expressed on Tfh cells (Fig. 1), which was consistent with a recent study (9). We found that the transfer of BTLA−/− Tfh-like cells to WT mice induced more Ag-specific IgG2a and IgG2b production than did the transfer of WT Tfh-like cells (Fig. 3). In contrast, BTLA expressed on B cells was not significantly involved in the regulation of Tfh-like cell-mediated IgG production (Fig. 4). Moreover, we also found that the development of IL-21–producing Tfh-like cells was significantly increased in BTLA−/− CD4+ T cells compared with WT CD4+ T cells (Fig. 5). Finally, we demonstrated that IL-21 was essential for Tfh-like cell-mediated IgG production (Fig. 6). These results suggest that BTLA suppresses IgG2a and IgG2b production in vivo by inhibiting IL-21 production from Tfh cells. It has been well recognized that Tfh cells are the predominant Th cells that provide the help for B cells to induce Ab production (1–3). We showed in this study that BTLA regulates Tfh cell-mediated development of GC B cells and IgG production. We found that, although the development of Tfh cells was not affected in BTLA−/− mice, the development of GC B cells, which is enhanced by Tfh cells (28), was increased in BTLA−/− mice (Fig. 2). We also found that the transfer of BTLA−/− Tfh-like cells to WT mice induced more IgG2a and IgG2b production than did the transfer of WT Tfh-like cells (Fig. 3). These findings suggest that Tfh cell-mediated IgG responses are regulated by BTLA. In contrast, although BTLA was shown to be expressed on B cells (20, 29) and to function as an inhibitory coreceptor for BCR signaling (30), we found that the development of GC B cells (Fig. 4A) and the levels of IgG production (Fig. 4B) were comparable between Tfh-like cell-transferred BTLA−/− mice and WT mice, suggesting that BTLA expressed on B cells is not significantly involved in the regulation of Tfh-like cell-mediated IgG production in this system. Together with our previous findings that BTLA−/− mice exhibit enhanced Ag-specific IgG responses (20) and gradually develop hyper-γ–globulinemia and autoantibody production (21), it is suggested that BTLA expressed on Tfh cells may play a crucial role in the regulation of T cell-dependent humoral immune responses. We showed that BTLA−/− Tfh-like cells are more effective in eliciting IgG2 production than are WT Tfh-like cells (Fig. 3B). Because BTLA−/− Tfh-like cells are also more effective in eliciting GC B cell development than are WT Tfh-like cells (Fig. 3A), GC reaction seems to be involved in the enhanced IgG2 production in BTLA−/− Tfh-like cell-transferred mice. However, we could not exclude the possibility that BTLA−/− Tfh-like cells induce IgG2 production from short-lived plasma cells extrafollicularly. Further studies using a different Ag that enables the assessment of GC reaction by measuring the affinity maturation of Ab are required to address this point. We also showed that BTLA regulates the development of IL-21–producing CXCR5+ Tfh-like cells. By using intracellular staining of IL-21, we found that the frequency of IL-21–producing cells was significantly increased in CXCR5+CD4+ T cells compared with CXCR5−CD4+ T cells under Tfh cell-inducing conditions (Fig. 5), confirming that Tfh cells are potent producers of IL-21. In agreement with the enhanced GC B cell responses in the mice injected with BTLA−/− Tfh-like cells (Fig. 3), we also found that the development of IL-21–producing cells was significantly increased in BTLA−/−C XCR5+CD4+ T cells compared with WT CXCR5+CD4+ T cells (Fig. 5). 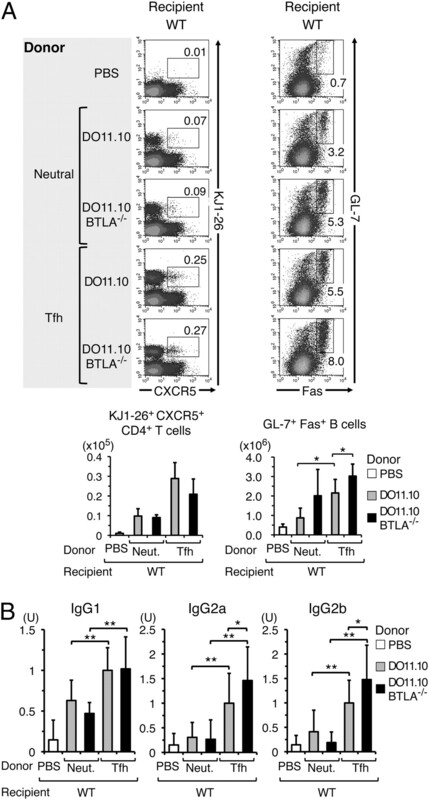 These results indicate that BTLA is crucial for the inhibition of IL-21 production in Tfh-like cells and suggest that the enhanced IL-21 production in BTLA−/− Tfh-like cells seems to be involved in the enhancement of GC B cell development and the production of Ag-specific IgG2a and IgG2b in BTLA−/− Tfh-like cell-transferred mice (Fig. 3). In addition, it is possible that factors, other than IL-21, that are expressed on or produced by BTLA−/− Tfh-like cells are also involved in the enhanced BTLA−/− Tfh-like cell-mediated IgG2a and IgG2b production. This possibility should be addressed in future studies. Regarding the transcriptional control of IL-21 expression, it was demonstrated that NFATc2 directly binds to and activates transcription of IL-21 promoter in Th2 cells (31). On the contrary, T-bet suppresses the transcription of IL-21 by inhibiting the binding of NFATc2 to the promoter in Th1 cells (31). In addition, a recent study showed that the genetic loss of c-Maf, which is considered an IL-4–specific activator (32), results in reduced IL-21 production in Th17 cells (33). Moreover, we found that IL-6 induces the expression of c-Maf; subsequently, c-Maf induces IL-21 production in CD4+ T cells by directly activating IL-21 promoter and enhancer through Maf response element sites (34). In contrast, it was recently shown that although Bcl6 promotes the development of Tfh cells by inhibiting the differentiation of Th1 and Th17 cells (35–37), Bcl6 is not required for IL-21 production in CD4+ T cells (35). Because the ligation of BTLA induces the association of SHP-1 and SHP-2 and attenuates TCR signaling (20), it is likely that the expression of some of the transcription factors that are induced by TCR signaling are enhanced in BTLA−/− Tfh cells. However, in preliminary experiments we found that the expression levels of NFATc2, T-bet, c-Maf, and Bcl-6 in BTLA−/− Tfh-like cells were similar to those in WT Tfh-like cells. The functional alteration during the development of BTLA−/− Tfh-like cells, rather than the loss of BTLA signaling in the developed Tfh-like cells, may also be involved in the enhanced IL-21 production in BTLA−/− Tfh-like cells. Further studies are required to address the mechanisms of the enhanced IL-21 production in BTLA−/− Tfh-like cells. 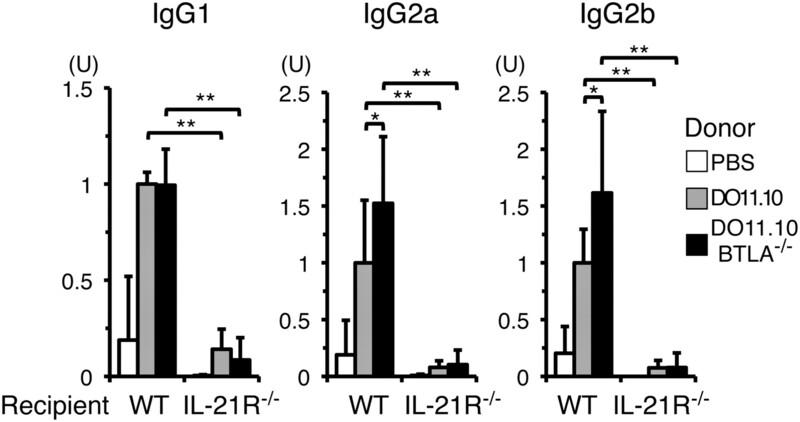 Finally, we directly demonstrated that IL-21 is involved in Tfh-like cell-mediated IgG responses, although the circumstantial evidence for it has been presented separately that Tfh cells are required for B cell help and also produce IL-21 (9, 10, 28) and that IL-21 potently induces the differentiation of B cells into Ab-producing cells (7, 8, 28). We showed in this study that Tfh-like cell-mediated IgG production was abolished when IL-21R−/− mice were used as recipients (Fig. 6). The analysis of IL-21−/− and IL-21R−/− mice showed the importance of the IL-21–IL-21R pathway in GC formation and B cell responses to T cell-dependent Ags (7, 8). Recently, Vogelzang et al. (10) demonstrated that the expression of IL-21R on T cells is vital for mounting IgG1 responses to T cell-dependent Ags. More recently, it was demonstrated that IL-21 acts directly on B cells for mounting GC B cell responses (38, 39). Taken together, these results suggest that the expression of IL-21R on Tfh cells, as well as the expression of IL-21R on B cells, is essential for Tfh cell-mediated IgG production. The pathophysiological significance of the enhanced IL-21 production in BTLA−/− Tfh cells is still unknown. IL-21 was shown to be involved in a number of autoimmune disease models. For example, lymphopenia and compensatory IL-21–mediated homeostatic expansion of lymphocytes are associated with the development of autoimmunity in NOD mice (40). In addition, IL-21R deficiency prevents the onset of diabetes in NOD mice (41, 42). The excessive production of IL-21 is also associated with the development of high titers of autoantibodies and a lupus-like pathology in sanroque mice (43). In contrast, we previously showed that BTLA−/− mice gradually develop hyper-γ–globulinemia and autoantibodies (21). The analyses of mice lacking both BTLA and IL-21R will determine whether the autoimmune phenotype of BTLA−/− mice is caused by the enhanced IL-21 production. In conclusion, our findings suggest that BTLA suppresses GC B cell development and subsequent IgG responses by inhibiting IL-21 production by Tfh cells. These findings would markedly increase our knowledge of the mechanisms underlying Tfh-mediated humoral immune responses. Although further studies are required to address the underlying mechanisms, our data also suggest that the enhancement of BTLA signaling in Tfh cells by agonistic ligands or by a stimulatory Ab might be applicable for the treatment of autoimmune diseases. We thank Dr. M. Grusby for IL-21R−/− mice and Dr. K. Murphy for DO11.10 mice and BTLA−/− mice. We also thank Drs. T. Tokuhisa and A. Sakamoto for valuable discussion. This work was supported in part by Grants-in-Aid for Scientific Research from the Ministry of Education, Culture, Sports, Science and Technology; the Japanese Government, the Global Center for Education and Research in Immune System Regulation and Treatment; Ministry of Education, Culture, Sports, Science and Technology, Japan; and the Naito Foundation.
. 2008. T follicular helper (TFH) cells in normal and dysregulated immune responses. Annu. Rev. Immunol. 26: 741–766.
. 2001. Cutting edge: critical role of inducible costimulator in germinal center reactions. J. Immunol. 166: 3659–3662.
. 2003. Costimulation through the inducible costimulator ligand is essential for both T helper and B cell functions in T cell-dependent B cell responses. Nat. Immunol. 4: 765–772.
. 2008. Interleukin-21: basic biology and implications for cancer and autoimmunity. Annu. Rev. Immunol. 26: 57–79.
. 2009. Interleukin-21 (IL-21)-mediated pathways in T cell-mediated disease. Cytokine Growth Factor Rev. 20: 185–191.
. 2002. Interleukin 21 prevents antigen-induced IgE production by inhibiting germ line C(ε) transcription of IL-4-stimulated B cells. Blood 100: 4565–4573.
. 2006. IL-21-induced Bepsilon cell apoptosis mediated by natural killer T cells suppresses IgE responses. J. Exp. Med. 203: 2929–2937. 2005. The evolving crosstalk between co-stimulatory and co-inhibitory receptors: HVEM-BTLA. Trends Immunol. 26: 292–294.
. 2006. Balancing co-stimulation and inhibition with BTLA and HVEM. Nat. Rev. Immunol. 6: 671–681.
. 2009. The CD160, BTLA, LIGHT/HVEM pathway: a bidirectional switch regulating T-cell activation. Immunol. Rev. 229: 244–258.
. 1996. Herpes simplex virus-1 entry into cells mediated by a novel member of the TNF/NGF receptor family. Cell 87: 427–436.
. 2005. B and T lymphocyte attenuator regulates T cell activation through interaction with herpesvirus entry mediator. Nat. Immunol. 6: 90–98.
. 2005. A coreceptor interaction between the CD28 and TNF receptor family members B and T lymphocyte attenuator and herpesvirus entry mediator. Proc. Natl. Acad. Sci. USA 102: 1116–1121.
. 2003. BTLA is a lymphocyte inhibitory receptor with similarities to CTLA-4 and PD-1. Nat. Immunol. 4: 670–679.
. 2008. Development of autoimmune hepatitis-like disease and production of autoantibodies to nuclear antigens in mice lacking B and T lymphocyte attenuator. Arthritis Rheum. 58: 2498–2510.
. 2005. Identification of T cell-restricted genes, and signatures for different T cell responses, using a comprehensive collection of microarray datasets. J. Immunol. 175: 7837–7847.
. 2002. IL-21 limits NK cell responses and promotes antigen-specific T cell activation: a mediator of the transition from innate to adaptive immunity. Immunity 16: 559–569.
. 1990. Induction by antigen of intrathymic apoptosis of CD4+CD8+TCRlo thymocytes in vivo. Science 250: 1720–1723.
. 2008. Development and characterization of IL-21-producing CD4+ T cells. J. Exp. Med. 205: 1369–1379.
. 2000. Both stat5a and stat5b are required for antigen-induced eosinophil and T-cell recruitment into the tissue. Blood 95: 1370–1377.
. 2009. T cell intrinsic heterodimeric complexes between HVEM and BTLA determine receptivity to the surrounding microenvironment. J. Immunol. 183: 7286–7296.
. 2009. Follicular helper T cells as cognate regulators of B cell immunity. Curr. Opin. Immunol. 21: 266–273.
. 2004. An inhibitory Ig superfamily protein expressed by lymphocytes and APCs is also an early marker of thymocyte positive selection. J. Immunol. 172: 5931–5939.
. 2009. B and T lymphocyte attenuator regulates B cell receptor signaling by targeting Syk and BLNK. J. Immunol. 182: 1509–1517.
. 2005. NFATc2 and T-bet contribute to T-helper-cell-subset-specific regulation of IL-21 expression. Proc. Natl. Acad. Sci. USA 102: 2016–2021.
. 1999. The transcription factor c-Maf controls the production of interleukin-4 but not other Th2 cytokines. Immunity 10: 745–751.
. 2010. c-Maf activates the promoter and enhancer of the IL-21 gene, and TGF-β inhibits c-Maf-induced IL-21 production in CD4+ T cells. J. Leukoc. Biol. 87: 703–712.
. 2004. Homeostatic expansion of T cells during immune insufficiency generates autoimmunity. Cell 117: 265–277.
. 2008. IL-21 signaling is critical for the development of type I diabetes in the NOD mouse. Proc. Natl. Acad. Sci. USA 105: 14028–14033.
. 2009. Interleukin-21 is required for the development of type 1 diabetes in NOD mice. Diabetes 58: 1144–1155.